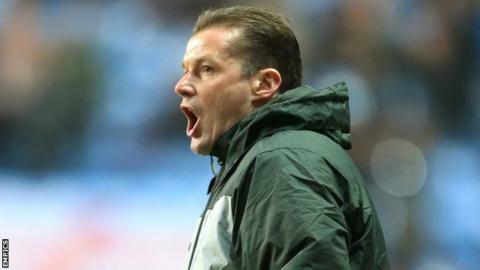 Stevenage boss Graham Westley has said he believes his side's was almost ruined by the officials. Boro reached the southern semi-finals with a 3-2 victory over the O's. But Westley was angered by the length of injury time added on and a red card for Roarie Deacon. "I'm fed up with it to be honest with you. The decisions given out there border on ridiculous," Westley told BBC Three Counties Radio. Stevenage led 3-1 after a frantic opening 16 minutes, but lost Deacon seven minutes before half-time for bringing down Orient striker Shaun Batt. Westley's men, 14 points and 17 places behind Orient in League One, conceded a Lloyd James penalty before the break but held on throughout the second period - and seven minutes of added on time - to inflict only a second defeat of the season on Russell Slade's side. "There's no way anyone among the officials could see that Deacon didn't get a foot on the ball," said Westley. "But the more important thing is Batt got a touch on it, emerged from the challenge and slipped on the turf three yards on. "The ball ran to our keeper, we had a covering defender and 30 yards from goal the player is sent off. It's absolutely ludicrous. "In added time, with five minutes having gone up, one substitute made [in injury time] and no other stoppages, we end up playing nearly seven minutes. "That sums up the way in which the decisions were made tonight. There was so much out there that just wasn't right and we should be talking about a high quality football match. "People shouldn't be coming along and ruining it for the fans. Fans pay good money to watch a game - they don't want to see us banked up with 10 men tying to hold on to a 3-2 lead. But unfortunately that's what we had to do."